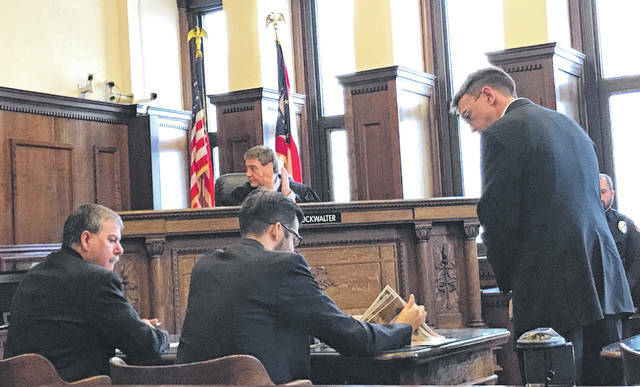 Anna Bolton | Greene County News Assistant Prosecutor David Morrison presents his opening argument to the jury as Defense Attorney John Leahy and Judge Michael Buckwalter listen Dec. 3 during the domestic violence trial. Defendant Timothy Hedges (left) and Assistant Prosecutor David Morrison (right) watch as Defense Attorney John Leahy flips through a stack of evidence photos. 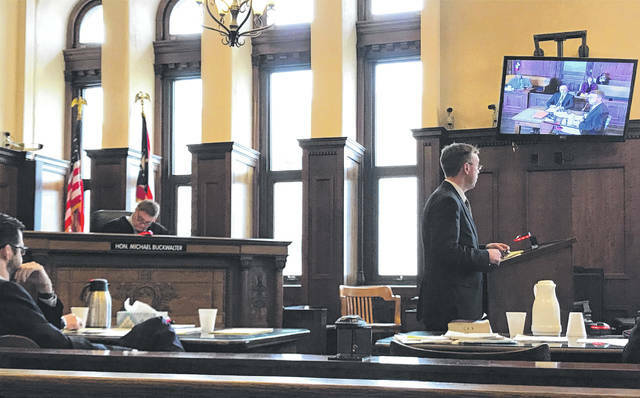 XENIA — The Village of Bowersville’s police chief stepped up to a witness chair in Greene County Common Pleas Court Dec. 3 to defend himself against a domestic violence charge. Timothy Hedges, 53, described himself as a full-time paramedic in Dayton and a part-time chief of the volunteer police force for the village, its population fewer than 350 residents. Hedges was charged with the fifth-degree felony — which court records say include mandatory imprisonment if convicted — after an alleged Aug. 18, 2017 altercation occurred in his Fairborn apartment. Morrison said the victim made her way to Hedges’ apartment to retrieve a personal document that day, using a key to open the door and finding Hedges asleep on the couch. Morrison said Hedges soon woke up and told her to give him the key and get out. Then, from behind, he allegedly put both his hands around her neck and dragged her to the door — at points lifting her off the ground. The victim testified that she was 21-years-old and 13-weeks pregnant at the time. “I used my arms and legs to grab onto doorways — do anything I could to get him off me. I was fighting with what I had to get away from him,” she said. Then, she said, he slammed the door in her face. The victim said she drove the mile and a half down the road to Fairborn Police Department, where she filed a report with Officer Travis Hunsbarger. “She was upset. She was crying. Her makeup was smeared. She had difficulty speaking, catching her breath,” Hunsbarger testified. After she was medically evaluated, the officer took photos of her face, neck and arms — the only pieces of physical evidence presented during the trial. “Those pictures will leave absolutely no question as to what happened in this apartment on this day,” Defense Attorney John Leahy told the jury during his opening arguments. When the state rested, Hedges took the stand. He described a verbal altercation that ended with him “escorting” the female out of the apartment. “I walked up to her. I used my left hand to grasp her left bicep. I placed my right hand between her shoulder blades. I turned her and I started walking her out of the apartment,” Hedges said, describing what he called a “suspect control technique” learned through officer training. “It’s to control the suspect without creating injury or harm,” he added. Leahy continued questioning Hedges, revealing a back injury that Hedges said prevents him from lifting more than 40 pounds. Attorneys will make their final arguments to the jury Dec. 4, followed by deliberation. https://www.xeniagazette.com/wp-content/uploads/sites/32/2018/12/web1_MorrisonOpens.jpgAnna Bolton | Greene County News Assistant Prosecutor David Morrison presents his opening argument to the jury as Defense Attorney John Leahy and Judge Michael Buckwalter listen Dec. 3 during the domestic violence trial. https://www.xeniagazette.com/wp-content/uploads/sites/32/2018/12/web1_Evidece.jpgDefendant Timothy Hedges (left) and Assistant Prosecutor David Morrison (right) watch as Defense Attorney John Leahy flips through a stack of evidence photos.